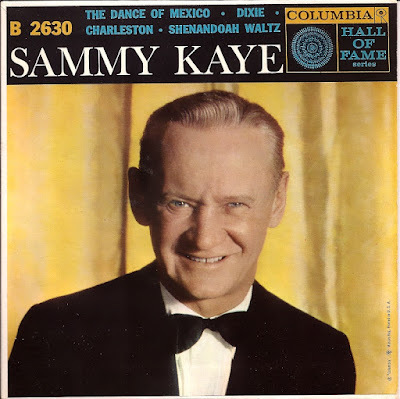 Sammy Kaye (born Samuel Zarnocay, Jr., 13 March 1910, Lakewood, Ohio – died 2 June 1987, Ridgewood, New Jersey) was a U.S. bandleader and songwriter. memorable tag line of the big band era, and millions of people did just that -- ''swing'' and ''sway'' to Sammy Kaye's orchestra. It was actually more just ''swaying.'' Kaye's arrangements never approached the swing end of the spectrum. His music fell quite tidily into the style of simple and commercial dance rhythms often called ''Mickey Mouse,'' and he was very successful at it. The son of Czech immigrants, Kaye graduated from Rocky River High School in Rocky River, Ohio in 1927. He began playing in college bands while at Ohio University in Athens. He was also a member of Theta Chi Fraternity. 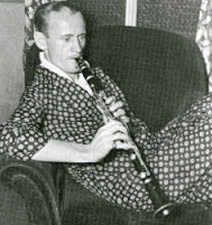 Kaye could play the saxophone and the clarinet, but he never featured himself as a soloist on either one. In the early 1930s he led his own orchestra at the Statler Hotel in Cleveland. A leader of one of the so-called "Sweet" bands of the Big Band Era, he made a large number of records for Vocalion Records, RCA Victor, Columbia Records, and the American Decca record label. He was also a hit on radio. Kaye was known for an audience participation gimmick called "So You Want To Lead A Band?" where audience members would be called onto stage in an attempt to conduct the orchestra, with the possibility of winning batons. Kaye was also known for his use of "singing of song titles", which was emulated by Kay Kyser and Blue Barron. Later he performed at many of the best hotels in New York and starred in his own radio program. 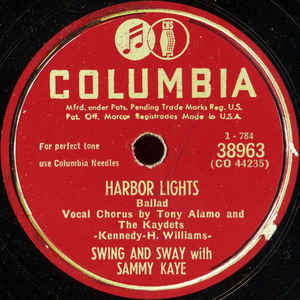 During World War II, millions of people danced cheek to cheek to such hits as "(There'll Be Bluebirds Over) The White Cliffs of Dover,'' ''My Buddy,'' ''There Goes That Song Again'' and ''Harbor Lights,'' which Mr. Kaye and his band performed live on his long-running NBC network show, ''Sunday Serenade,'' and also recorded for Victor Records. On Dec. 7, 1941, Mr. Kaye was conducting on the program when the announcer Ben Grauer broke in to announce that the Japanese had bombed Pearl Harbor. After the program, Mr. Kaye went home and wrote the song ''Remember Pearl Harbor,'' which became an immediate hit. 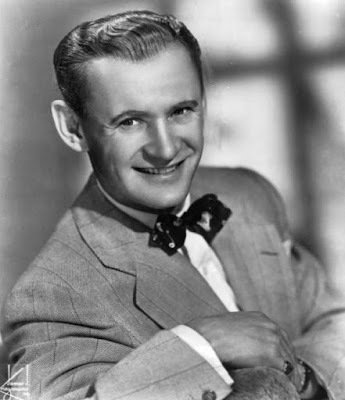 On December 17, 1942, Decca Records recorded the song, with Sammy Kaye's Swing and Sway Band and The Glee Club. 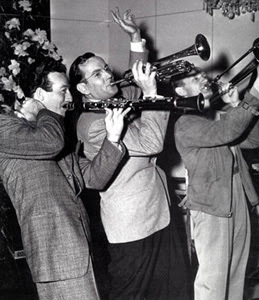 This gag photo, taken in 1942 at RKO Studios when the three bandleaders were each making a movie at the same time, shows Harry James, Glenn Miller and Sammy Kaye in that order, playing each other's instruments. Sammy was making Iceland with Sonja Henie and John Payne. The big hit from the movie was Another You. Vocalists at various times included Don Cornell, Jimmy Brown, Johnny McAfee, George Brandon, Maury Cross, Marty McKenna, Tommy Ryan, Charlie Wilson, Arthur Wright and Nancy Norman. Musicians included Ralph Flanagan, Dale Cornell and Marty Oscard. Kaye, was strict and demanded discipline, andthe sound that came out of his men's instruments was usually flawless. Kaye's dictatorial attitude as a bandleader was well known. He relied on several gimmicks to make his performances more entertaining. Kaye's radio program moved to television during the 1950s. He continued recording up until the 1960s. He eventually retired to Southern California, though his orchestra carried on under In the musical the direction of trumpeter Roger Thorpe. It still performs to this day. Kaye was a friend of President Nixon and performed at the inaugurations of both Presidents Nixon and Reagan. A successful businessman and longtime New York City resident, he became wealthy through investments in publishing, bowling alleys and other ventures. Kaye died from cancer at Valley Hospital in Ridgewood, New Jersey. His body was returned to Lakewood, Ohio and after a Mass at St. Christopher Catholic Church in Rocky River, he was buried in the family plot next to his parents at Lakewood Park Cemetery. 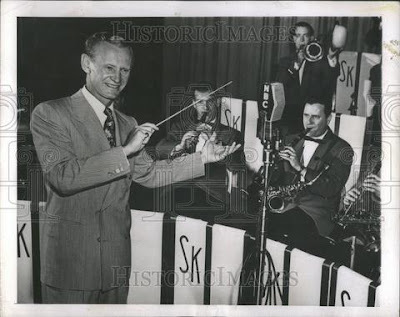 Prior to his death in 1987, Sammy Kaye left his orchestra to Roger Thorpe of New Paltz, NY. Thorpe, an accomplished music professor at SUNY Dutchess and director of the Dutchess Jazz Ensemble, knew Sammy from over the years. Thorpe still continues to operate the orchestra to this day. Sammy Kaye performs his hits in this rare 1978 TV appearance and is joined by his former vocalist Don Cornell for their million-selling hit "It Isn't Fair". 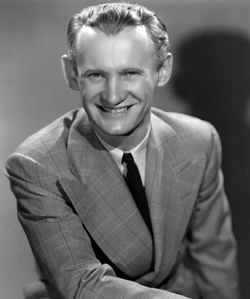 Sammy Kaye was one of the most popular band leaders between 1937-1970, having charted more than one hundred times on Billboard. "Yearning" includes the major hits "Harbor Lights," "Roses," "Walkin' to Missouri," and Great cover versions of '50s hits: "No, Not Much," "The Great Pretender," "It Wasn't God Who Made Honky-Tonk Angels," and "Lisbon Antigua." Majority of the tracks are debuting on CD including the entire best-selling LP, "SERENADE OF THE BELLS." Great band and songs. Thanks Bob.